I've been in a major decorating mood as of late. Just really wanting to make our house feel a little more like home. I've lived here nearly two years, and have hardly hung a single picture on the wall. Now that Andrew and I live here together, and we don't plan on moving anytime soon, I figure it's about time to decorate! So up to this point, I've been fighting the pink. I had some old towels from years ago that are brown and light blue, so I tired to distract from all the pink with those. But I've started thinking, maybe it's time to embrace the pink. I thought maybe bringing in simple neutrals like white, grey and wood tones, would balance the pink. Then I can accent with pops of gold. Sorry Andrew, looks like this bathroom is going to be feminine. These are some images I've seen around Pinterest that inspired my idea for simple, neutral tones. I've already gathered a few wine crates, and have them on the large counter area for added storage like you see below. I'm thinking about staining them a darker color, but I really like the look overall. I'd also like to add some art, possibly some fun typography prints like this. I've also hung a shelf with little hooks where I display my bauble necklaces for a fun pop of color. Plus, that way it's easy to grab one in the morning when I'm getting ready. I figure you can't go wrong with neutrals, and part of me actually loves the vintage tile so I think this mood board is a step in the right direction. This is what I'm working with people (ignore the awful photos). Do you think this is a good starting point? 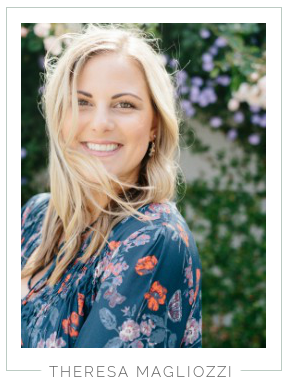 Or do you have any recommendations for me? i think embracing the pink is a good idea. maybe with the neutrals instead of blue it wont stand out as much! Oh man, you weren't kidding about that tile girl! 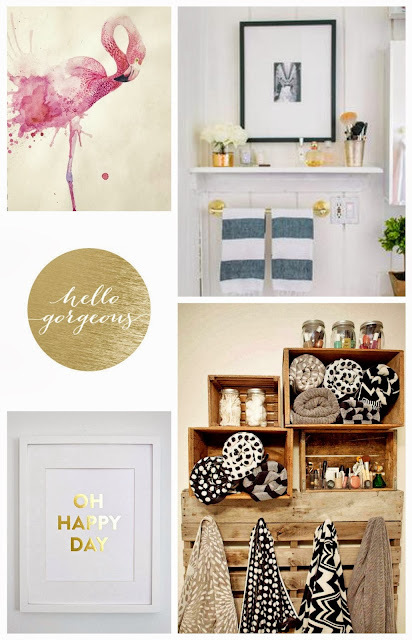 I would definitely spruce it up with a lot of neutral colors, and I think the ones you picked in the mood board are great for this bathroom. Can you hang a few prints on the wall as well? I would definitely do that. I'm not much help...sorry. I'm so bad at decorating on my own. I always have to have an inspiration photo. Can't wait to see how it turns out. I am impressed with the size of your bathroom! Embrace those tiles girl! 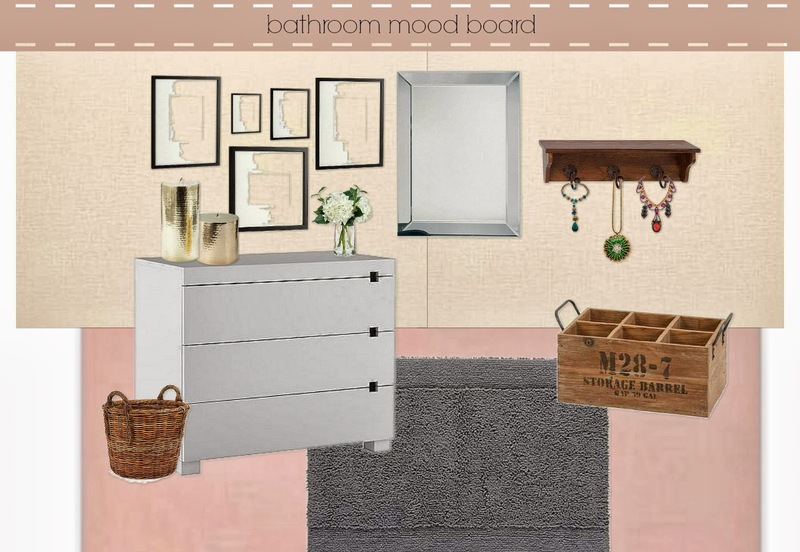 I love your mood board for you bathroom... I think it will look great!! I think with some neutrals and prints on the wall it will turn into a really cute, cozy bathroom! Go with your gut! haha :) I have no decorating tips, but I am SURE whatever you end up with will look fabulous. I definitely would frame the mirror in a rustic wood, and hang prints also in matching wood frames that have a similar peachy pink color scheme in them. 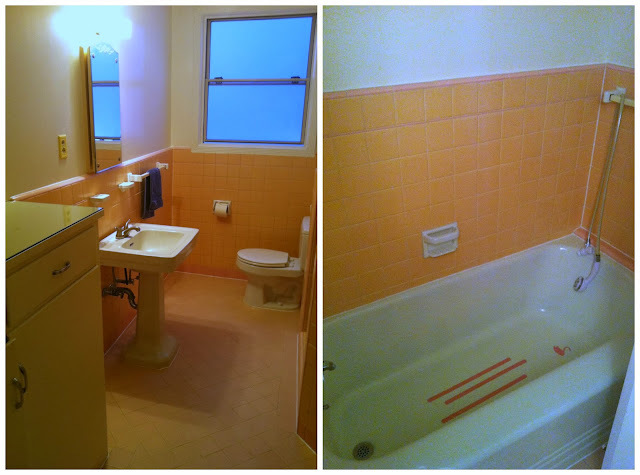 I remember those SF bathrooms, and they are definitely soo challenging to make homey. I also always had fresh flowers cut and plenty of yummy smelling candles.